Downtown Grand Rapids. 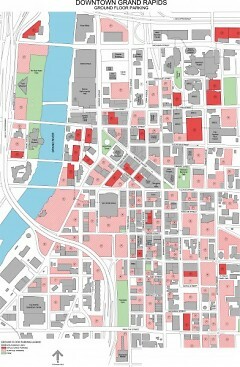 Solid red indicates parking structures. 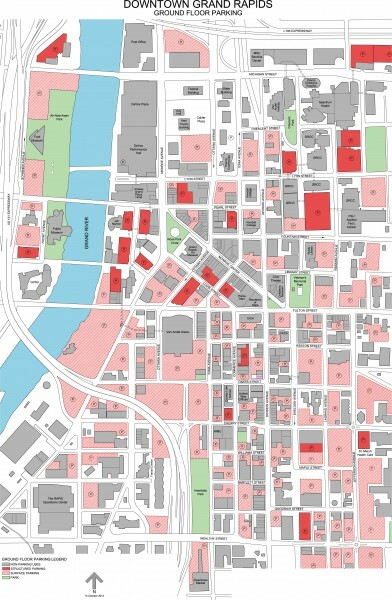 Hatched red/pink indicates surface parking lots. /Courtesy of Nederveld, Inc.
"There is now two mixed use buildings there with different businesses and people living above them, whereas before, they were empty and boarded up,” says Miller. According to Miller, city building begins at a building-by-building scale until the surrounding neighborhoods are strong and vibrant. 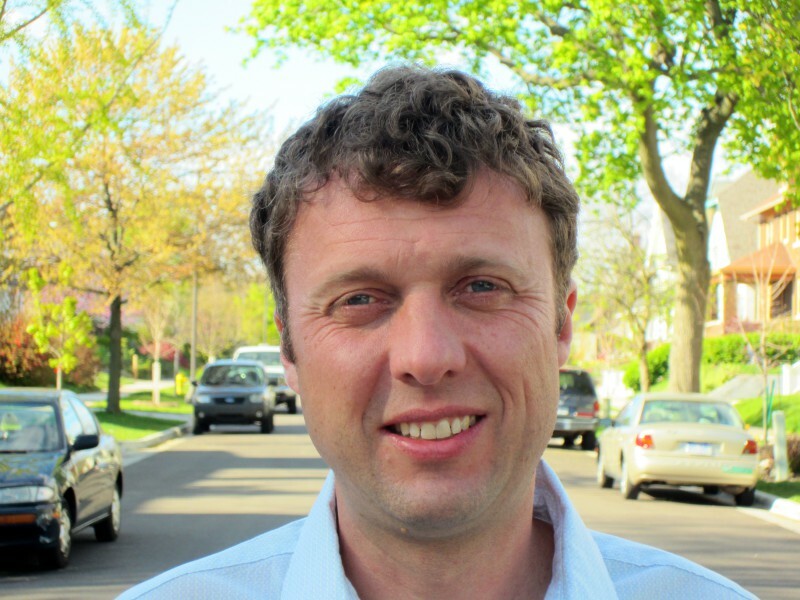 “A city is only going to be as good as all of its neighborhoods,” says Miller. In order to build a strong city, Miller stresses the importance of taking into account public input and need and usage. While he acknowledges that in the past, his own profession of urban planning and architecture has lacked taking public interests into account, Miller and his associates at Nederveld have taken into account public input when redesigning a portion of 28th St. in Wyoming. Nederveld also created two area specific plans for the Midtown Neighborhood Association and the Belknap Neighbors. Specifically, Miller points to the Midtown specific plan as a great example of how utilizing public input and public enthusiasm can affect change rather quickly in urban redesign. “The [Fulton Street] Farmer’s Market that you see today is really the beginning,” says MIller. Originally, Miller expected that this was the type of project that would take 20 years. While harnessing public input, the project took five years. “Because of the public input that was involved with that, I think it began to create the energy to help move that farmer’s market along,” says Miller. 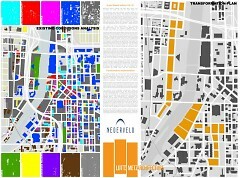 At a larger scale, Miller and Nederveld have been tirelessly working on reimagining the City of Grand Rapids. And they are very interested in getting public input. Miller recently spoke at a Rapid Growth Speaker Series event. At this event, Miller and other panel members discussed the changes and evolution of Grand Rapids and how development plays into building a vibrant city and community. Miller points to the millions of dollars the city and private investors have poured into the DeVos Convention Center and the soon to be completed Downtown Market project at 435 Ionia Ave. as examples of exciting building blocks for a vibrant city. A big barrier to continuing the growth of Grand Rapids is, according to Miller, is our dedication to the automobile. Two main issues are the sheer volume of surface parking lots in the downtown area and US 131. A large percentage of downtown is dedicated to surface parking lots, and Miller points out that having large amounts of surface parking lots discourages walkability in cities. According to Miller, if there are buildings lining streets, people walking on the streets can see in and out of them. Miller argues that surface parking lots discourage engagement and decreases pedestrians’ desire to continue walking. Instead of seeing the hustle and bustle of businesses and restaurants, parking lots treat pedestrians to Miller’s analogy of missing teeth. Miller believes there are great opportunities for building a vibrant city by repurposing many of these surface parking lots, especially the properties near the Grand River. Miller mentions possibly building shops or restaurants along the riverfront property dedicated to surface parking on the south side of Fulton St. Miller also mentions the possibility of reinstalling rapids as a great way to leverage a unique resource while making best use of space. “What it does is brings us closer to the natural environment at an urban scale,” says Miller. According to Miller, a great example of a building project that does not leave downtown devoid of parking is the building at 38 Commerce Ave. The building is multi-use, with retail space at the ground level and apartment and condo living above the retail space. The building also houses a parking deck that is hidden from pedestrians on Commerce Ave. While people may bristle at the idea of ridding downtown of parking spots, the other issue that partially limits city building may be an even larger issue to the public: ridding the city of the US-131 barrier. According to Miller, the large highway overpasses discourages walkability and connectivity. Large highways which bisect cities often have the same issues as surface parking lots. They discourage engagement and discourage people from continuing their walk and is not the best use of land. Shops and businesses are much more inviting to pedestrians than the large pillars of concrete which hold up 131. 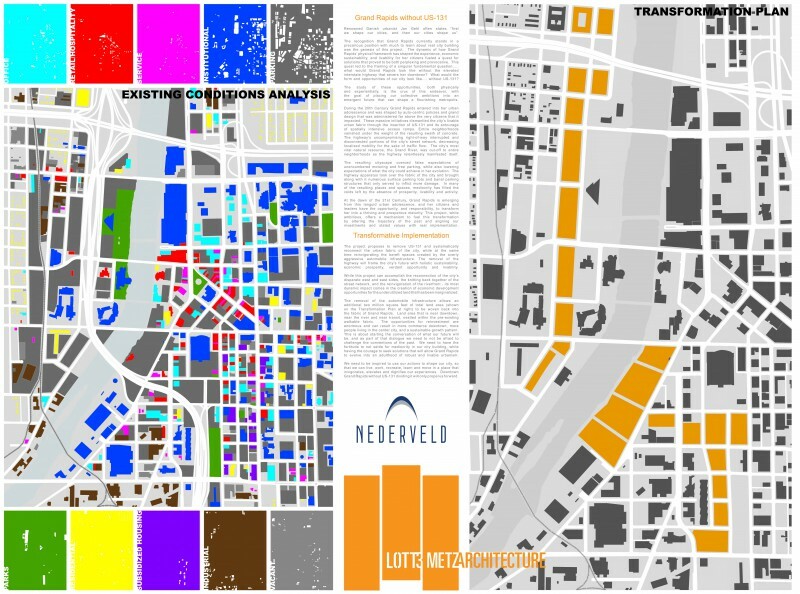 Miller, Nederveld and Lott3Metz Architecture have created a transformative plan that imagines Grand Rapids without US-131. Their plan allows an additional two million square feet of total land area that can be used for development and city building. “Burying 131 is an option, and I think it needs to be considered, but we could also think about this in terms of an at grade boulevard,” says Miller. While there may be some resistance to changing the infrastructure of 131, Miller points out that Milwaukee, Portland and Boston have buried highways. Additionally, New Orleans and St. Louis have also been discussing the possibility of burying highways. A boulevard may also work as an option, as they have in other cities. Miller also points out that while construction was taking place on 131 in the early 2000s, the highway was shut down and the downtown street grid absorbed the traffic. “We have proven that the city can absorb the traffic that is on 131,” says Miller. While Miller mentions the ideas of burying 131 or turning 131 into a boulevard, he thinks it is important to take into account new ideas and weigh the pros and cons of every feasible option. However he is adamant that we must change how we think about transportation. At some point 131 will have to be rebuilt or repaired, and the public must take into account the best way to build a city for the 21st Century. During the 50s and 60s, 131 ran through Grand Rapids in an attempt to compete with the economic development that was occurring in the suburbs. Miller points out that economic development did not occur in the City of Grand Rapids. “For retail to occur, you need traffic. You need to have a lot of traffic on your streets. Cars and people,” says Miller. “And by moving them off the streets and putting them on  helped to kill [development]. Miller believes that we can learn lessons from how Grand Rapids has spent transportation dollars in the past. Increasing traffic capacity is not a means for increasing economic development and city building. In order to build a strong, 21st Century city, Miller believes that need a higher population density. Currently, downtown has a lot of attractive draws, such as the arena and convention center, but we must begin to fill the gaps between those large projects with grocery stores and other pragmatic businesses. Miller again points to the auto infrastructure as a roadblock in city building and the continuous development of Grand Rapids. “To get more robust transit usage and service, to get more people walking, to get more people on the street, to get more people bicycling. We’ll have a better city if we do that,” says Miller.